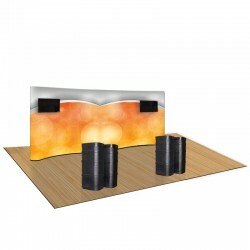 Our interactive pop up display media kits offer our professionally finished VESA monitor mount and iPad mount kits to allow you present your digital media messages directly from the front face of your 1UP pop up display. Quality since 1999, Affordable Exhibit Displays, Inc. has been exclusively producing our premium branded 1UP popup display insuring you can make the most of your budget. 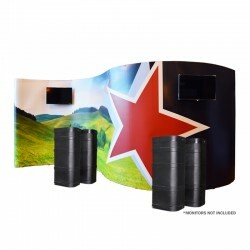 Our factory direct 1UP Media pop up display kits offer huge strength and reliability all in a transportable size. The included monitor mount hanging bracket makes your new professional pop up display interactive to enhance the trade show experience. 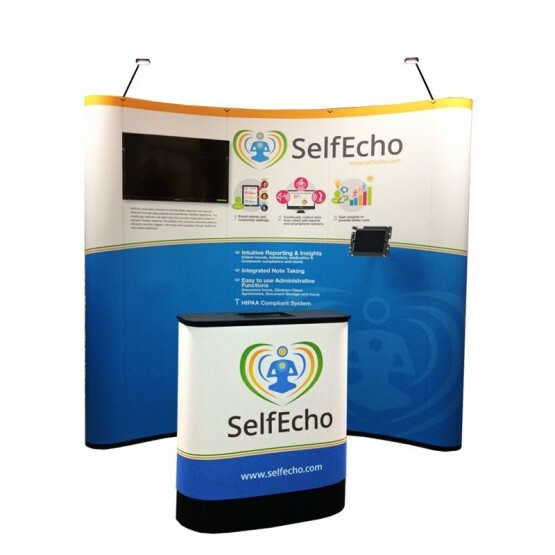 The Interactive Media kits all include easy to use monitor mount(s) to provide excitement and movement in your trade show booth. Choose from many pop up display sizes such as 6ft wide Curved, 8ft wide Curved, 10ft wide Curved or 10ft wide Straight plus the 16 ft Gullwing or 20ft Gullwing,the 20ft Straight and 20ft Serpentine. 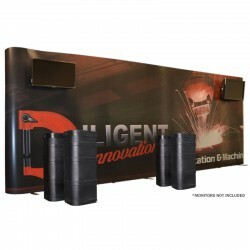 Your brilliantly colored center graphic panels are printed with an outstanding 8 color printing process and will surely stand out from the rest with high impact graphics that are vibrant and bright. These easy to use custom printed center PhotoMural graphic panels also automatically auto-align to the strong and sturdy aluminum frame using its magnetic channel mounting bars. Plus, everything is transported in its very own roto-molded and constructed USA made convenient compact shipping cases. Quickly hang your monitor on the front of the pop up display on the vertical monitor mount kit. Interactive monitors allow you to present your digital media messages professionally and allow you to directly showcase your company on the front face of your 1UP popup display. Able to fit 17” - 32” LED or LCD monitor screens (max monitor weight is 40 lbs.) with VESA measurements of 75MM x 75 MM, 100MM x 100MM, 200MM x 100MM or 200MM x 200MM. Plus, the mount has a screen tilt features allowing you to move the monitor position up or down by 20 degrees. This style pop-up display model is named "popup" due to its frames popping-up action. 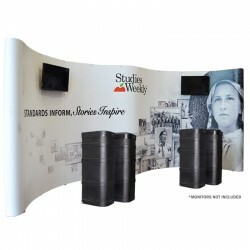 The 1UP trade show booth features several unique advantages over other similar popup display stands, especially due to it being a Maine, USA Made Product, the framing and auto-click Neodymium magnetic system is backed fully by a full Lifetime Warranty and all fabrication is completed in-house at our facility.